To print an embedded chart as part of the data on the worksheet, you simply print the worksheet (from the Print panel in Backstage view by pressing Ctrl+P). Before you print an embedded chart along with worksheet data, view the chart in the Page Layout or Page Break Preview view. You may need to move or resize the chart so that it fits nicely on the page. To print an embedded chart by itself without the supporting worksheet data, click the chart to select it before you press Ctrl+P to open the Print panel in Backstage view, where Print Selected Chart appears as the default selection in the first drop-down menu under Settings. To print a chart that’s on a separate chart sheet, activate the chart sheet by clicking its sheet tab and then press Ctrl+P to open the Print panel in Backstage view, where Print Active Sheets appears as the default selection in the first drop-down menu under Settings. Draft Quality: Select this check box to print the chart using your printer’s draft-quality setting. 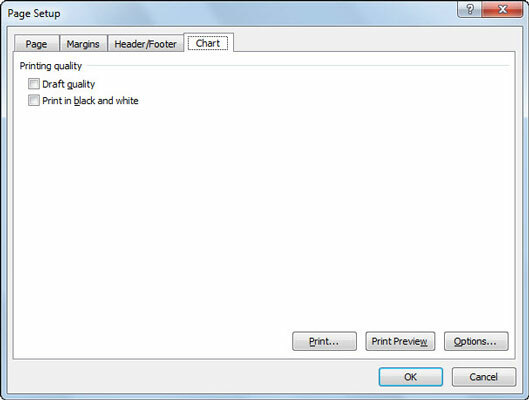 Print in Black and White: Select this check box to have your color printer print the chart in black and white. If you only have a black-and-white printer, it doesn’t make a difference. Enable faster chart printing with the Printing Quality settings in the Page Setup dialog box.